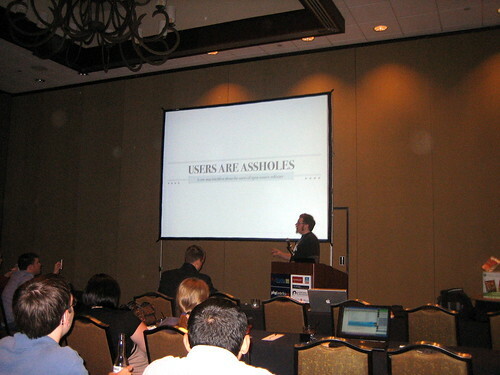 Well, works was the first industry conference I ever attended other than Ohio Linuxfest, and the first conference of any kind since like ACM Sigmod 2000. (Wow, that was 8 years ago.) I had a blast and learned a lot. I even learned about some things related to PHP. The most interesting one for me, uh, emotionally was probably the AI talk. Brings me back to my days in SB. The most useful topic which I could probably put to use at work tomorrow was the SMS/XMPP talk. I managed to make it downtown one night, and got to meet some new people. The last highlight I’ll mention were the Pecha Kucha talks on Thursday night. It was interesting and a ton of fun. The open bar didn’t hurt either. See a few more photos from php|works 2008.